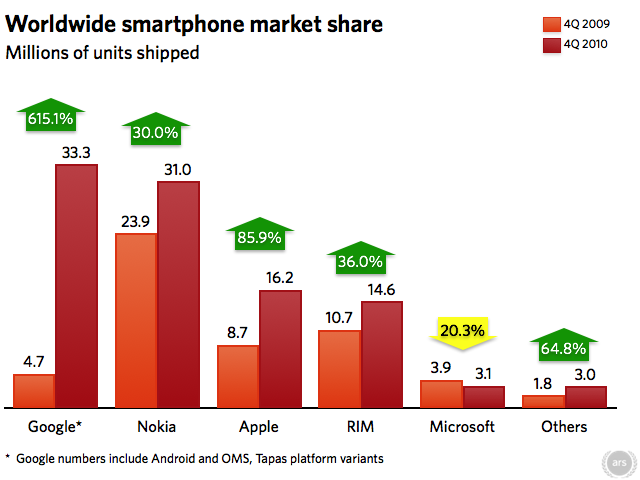 Ars Technica (and others) are reporting that Android-based mobile devices have passed Apple and even Nokia in volume in the final quarter of 2010. What’s of note about Android? Let’s face it, it has become an imitation of Apple’s iOS. Note: I use an Android phone, the Galaxy S, as my main phone, though I also use a variety of Apple devices. For the user, Android is “like iOS, only slightly messier, and slightly worse.” And Apple’s industrial design is still superior, too. Why then has Android been able to make progress in this way? It really is because it is open, and open-source – and so free to anyone who wants to use it – despite Steve Jobs’s comments. Any manufacturer, any carrier, can pick it up, do whatever they want with it, make it what they want it to be. Consequently, every route to market, every positioning, every geography, every price point is covered by the creativity of the general market. Just as Linux did in server systems, the open-source approach creates a flood of low-cost experimentation that submerges more established, more expensive, and less flexible platforms, despite the apparent superiority of the existing non-open solutions. Nokia’s CEO, Stephen Elop, stated that, due to commercial pressures, Nokia is considering “multiple ecosystem partners”, which most took to be a hint of an Android future for Nokia. Further reviewing his remarks, I might guess that he would look to use Android for mass-market devices, reserving Nokia’s high-end for the new(ish) MeeGo operating system. Yes, Apple’s iPhone remains the most highly valued by users, the BMW(*) of this market while Android perhaps amounts to Toyota. Yet if Nokia does switch partially to Android, Android phones will amount to over half the total cell-phone market, up from 10% just a year ago; and Android will have 3 or 4 times Apple’s volume. As a startup, the lesson that gets learned again and again is that it is hard to compete with free, and that exploiting “free and open source” gives you a chance to grow, iterate and disrupt in a way that conventional go-to-market approaches rarely do. To go down that path, you do need to find a way to be operate in a lean fashion and/or live off advertising dollars (FaceBook being the example of the moment), or else find a rich parent as the Android team with Google. And you have to really achieve the potentially massive uplift that free-and-open-source can give you. (*) Granted, the BMW position can be very profitable, too. Yes, I agree that Android can’t plausibly claim to be more reliable than iPhone. On the other hand, I don’t think reliability is Toyota’s differentiation from BMW (*) – reliability is their differentiation from Western volume manufacturers, especially GM, but price + ubiquity is the difference vs. BMW, just as it is for Android vs. iPhone. (*) Even though they are in fact somewhat more reliable.